Not everyone is moving in lockstep with the NTIA-ICANN-Google effort to force everyone to accept ICANN, a California corporation chosen solely by the United States government and accountable only to its own self-selected Board of Directors, as the one and only global Internet DNS authority with total control over the global internet root zone a/k/a the IANA functions. One such organization with "other ideas" is the Just Net Coalition. Below are excerpts from the latest Just Net Coalition proposal on the IANA transition and ICANN accountability. 22. 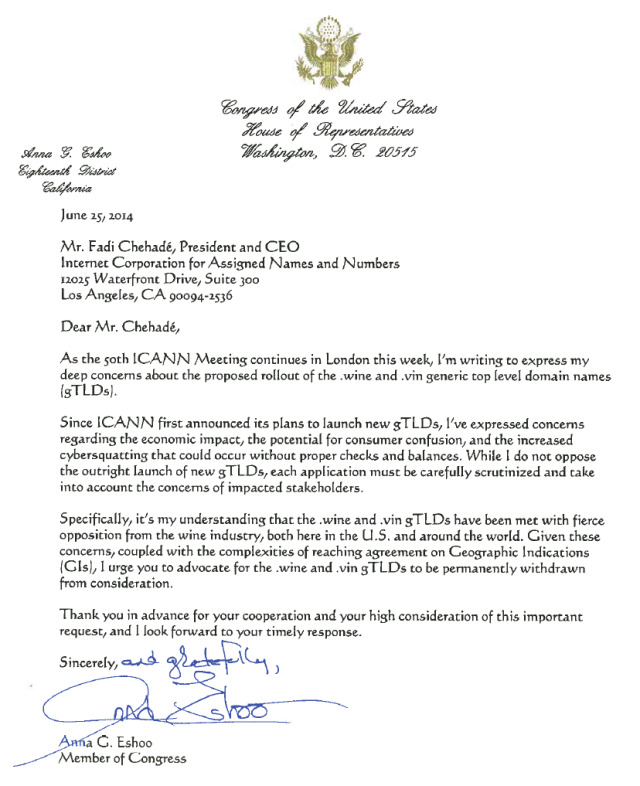 Further, countries should be allowed to ask for additional ccTLDs and should be granted additional ccTLDs upon request. In addition, if a gTLD registry and a country wants to give a gTLD a status equivalent to that of a ccTLD (similar to the above proposal for “.mil”, “.edu”, “.com”, and “.org”), they should have the right to do so. 32. Create a new entity that would perform the root zone management function. It would be structurally separate from ICANN. It would be a Swiss non-profit association, and would request that the Swiss government grants it immunity of jurisdiction. The members of the association would be the domain name registries (both gTLD and ccTLD). The domain name registries would fund this new entity. 33. ICANN would be the interface between the gTLD registries and the new root zone management entity. ccTLD registries would communicate directly with the new root zone management entity. 34. The IETF would decide who should perform the protocol parameters part of the existing IANA function. That could be the new entity of 31 above or any other organization chosen by IETF. The protocol parameter function would be funded by ISOC. 35. The NRO would decide who should perform the IP address part of the existing IANA function. That could be the new entity of 32 above or any other organization chosen by NRO. The IP address function would be funded by the RIRs...."
What really struck me in reading INTA's 1998 paper is how often it makes the same points I made recently. Oh well, maybe someday the global internet community will have a responsible and representative governing body over the internet DNS, guided by the wider public interest and governing the DNS as a public resource. How Will New gTLDs Impact Small Business? | SCORE: "... Four out of five SMB website owners prefer a .com web address over a new gTLD web address - 81% of SMB website owners believe new gTLDs will be confusing to their customers - 94% of Internet users feel safe visiting a .com website VS. 33% of Internet users feel safe visiting a new gTLD website... "
Cloud-based storage, gaming, augmented reality, wearable technology, 3-D printing and more. Reaction to the U.S. government’s announcement regarding its intention to transfer its stewardship role over the Internet’s Domain Name System (DNS). Conflicts between trademarks and governments over geographic names and their use in the DNS. Effective management of social media interactions between rights holders, platforms and users of social media. New changes to the WHOIS domain name directory system, and what trademark owners think about them. Lessons learned by applicants, service providers and industry when they applied for a new generic top-level domain (gTLD) in the first round. Internet intermediary liability regarding online sales. New gTLDs and rights protection mechanisms (RPMs) to help protect trademarks, including the Trademark Clearing House, the Post-Delegation Dispute Resolution Procedure (PDDRP), the Uniform Rapid Suspension system (URS) and traditional litigation. What brands can do to ensure their own security and to re-establish trust with their consumers. National security and government surveillance, offensive and defensive brand attacks, and consumer-focused data collection and usage. Learn latest developments on the newest topics relating to trademarks and the Internet and meet leaders of the trademark community, Internet experts and high-level government officials. The most important takeaway from the Verisign earnings call (registry for .COM and .NET) is in bold below -- Verisign +11.6% on healthy guidance, buyback expansion - VeriSign, Inc. (NASDAQ:VRSN) | Seeking Alpha: "... The company has $1.5B in cash to finance buybacks with. Q2 domain name net adds totaled 420K, towards the low end of a 300K-800K guidance range. But Verisign expects net adds to grow to 600K-1.1M in Q3. Total active .com/.net domain names amounted to 128.9M at the end of Q2, +3.7% Y/Y. However, processed domain names slipped by 200K Y/Y to 8.5M, and the company discloses renewal rate fell 60 bps [basis points] in Q1 to 72.6% ..."
So there you have it: Q2 2014 Verisign had total domain name net adds of 420,000 but expects total domain name net adds to grow to 600,000 to 1,100,000 in Q3 2014. No explanation was given as to how this will happen, but it will be interesting to watch and see if Verisign is right. Tracking daily net adds recently for all gTLDs on Registrar Stats has indicated the domain extensions consistently driving net new growth in gTLD domain name registrations are .COM and .XYZ (a new gTLD). All other gTLDs are either: (1) in the red (negative in net adds/losing registrations) which is where most of the legacy gTLDS (except .COM) are; (2) at zero or near -0- net new registrations which is where most of the new gTLDs are since they do not have any renewals or drops until next year and are not getting many new registrations; or (3) have some growth although mostly unimpressive (the sole standout in this subcategory being .CLUB with total registrations of 88,529 as of July 25). Total net adds for all the gTLDs (legacy including .COM + all new gTLDs) were almost 34,000 for July 25th. If you subtract the .COM net adds, then all the other gTLDs (new and old) only garnered about 10,000 net new adds, most of which went to .XYZ. How many of those .XYZ adds were for free domain names, is unknown. And of course, not every day recently shows such adds for either .XYZ or .COM (which also has a few net loss days recently). So, yes ICANN decided to increase the number of gTLD domain name extensions from 22 to over 1000, but increasing supply does not increase demand. There will be many losers (many new gTLDs are already failing in registration growth) and just a few winners. Currently the total gTLD pie of net new domain name registrations is growing, albeit slowly if you subtract the net new adds in the .COM and .XYZ extensions from the totals. Global growth is driven by ccTLDs: "In the last seven years ccTLDs have driven the growth of the global market, out-growing gTLDs every year except 2010 when a near 10 million drop in .cn domains (due to policy changes) had a massive impact on the total. In 2012 ccTLDs grew nearly three times as fast as gTLDs (+18.3% vs +6.4%)." Update October 23, 2014: Dot COM Still King! Verisign 3Q 2014, Highest Q3 on Record! Computerworld: "...Although China has long reigned as the country with the world's largest Internet population, the services are still struggling to take off in the rural areas, where about 450 million people never go online, said the CNNIC in its bi-annual report. Total Internet penetration in China is at 46.9 percent. This is far lower than the U.S, which has a penetration rate of 87 percent, according to Internet World Stats. Many of these non-Internet users in China have low education levels, and have little need to surf the Web, the research group added...."
The Times of India: "... online mobile services with rapid growth from the end of 2013 include music, video, gaming, search, and group-buying, all of which experienced double-digit increases. The fastest growing services were mobile payment, where users shot up 63.4%, online banking, with a 56.4% rise, and mobile travel booking, which was up 65.4%... Users of microblogs such as Tencent Weibo... fell for the second six-month period in a row, by 1.9% to 275 million. They numbered 331 million at the end of June last year before the government in September started clamping down on "online rumours" which it said threatened social stability... mobile messaging apps such as Tencent's WeChat have since become venues of choice for users who want to express views without fear of retribution." China Voice: More Internet companies should go abroad - Xinhua | English.news.cn: "During his trip to Brazil last week, Chinese President Xi Jinping, together with his Brazilian counterpart Dilma Rousseff, witnessed the launch of the Portuguese version of China's Baidu search engine. It is not the first time that a Chinese Internet company has launched a non-Chinese search engine, but it is the first time that a Chinese state leader has helped promote its services. More Chinese Internet companies should compete internationally, as they now have the ability and can make the world's cyber environment more balanced and just...."
#IANAsteward group accepts that GAC has 5 members in the committee, to ensure diversity of geographical representation. #IANAsteward Following again on-line; really good coverage; interesting discussion; good to see agreement on government representation. Statement from the First Meeting of the IANA Stewardship Transition Coordination Group (ICG) [PDF, 100 KB]"... The ICG will conduct itself transparently, consult with a broad range of stakeholders, and ensure that the final recommendation supports the security and stability of the IANA functions... Formal ICG communication channels are currently under development and will be communicated as soon as available." NTIA Announces Intent to Transition Key Internet Domain Name Functions | NTIA: "To support and enhance the multistakeholder model of Internet policymaking and governance, the U.S. Commerce Department’s National Telecommunications and Information Administration (NTIA) today [March 14, 2014] announces its intent to transition key Internet domain name functions to the global multistakeholder community. As the first step, NTIA is asking the Internet Corporation for Assigned Names and Numbers (ICANN) to convene global stakeholders to develop a proposal to transition the current role played by NTIA in the coordination of the Internet’s domain name system (DNS)." The IANA Coordination Group members: 30 individuals representing 13 communities (direct and indirect stakeholders). *17 July 2014 – The Coordination Group accepted the GAC's request to increase the number of GACrepresentatives in the Coordination Group from two to five. Google Inc. (NASDAQ: GOOG) held its quarterly conference call to discuss second quarter 2014 financial results on Thursday, July 17th at 1:30 p.m. Pacific Time (4:30 p.m. Eastern Time; 20:30 UTC). Join the conversation through use of the online discussion forum or ICANN's dedicated IANA Transition mailing list to discuss the transition process." 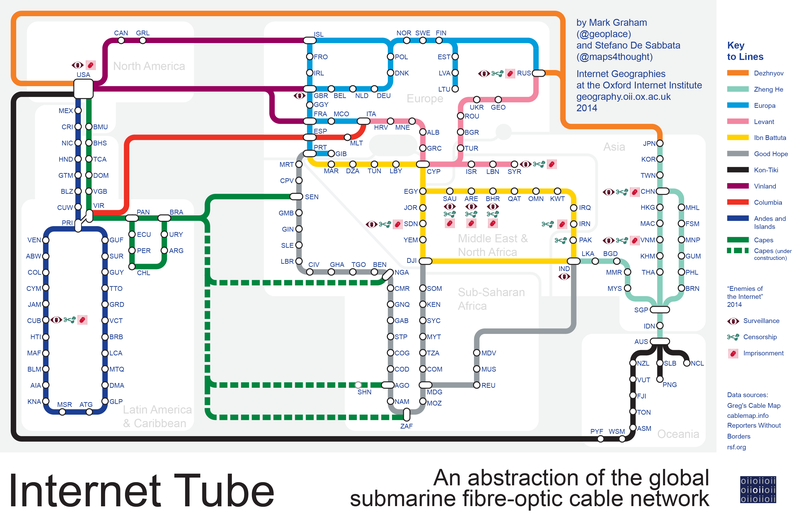 This schematic map shows a simplification of the world’s network of submarine fiber-optic cables. The map also includes symbols referring to countries listed as “Enemies of the Internet” in the 2014 report of Reporters Without Borders. The centrality of the nodes within the network has been calculated using the PageRank algorithm. The rank is important as it highlights those geographical places where the network is most influenced by power (e.g., potential data surveillance) and weakness (e.g., potential service disruption). Findings... The United States is by far the most connected country in the world, with submarine cable landing points on both coasts that connect it to most other continents. On the other side of the Atlantic, are the second and third most central parts the global network: the United Kingdom and Senegal. The UK has been a pioneer in laying submarine cables since the second half of the nineteenth century, and still controlled almost half of the world’s submarine cables in the 1920s. Senegal is where most of the southern Atlantic cables land, and it will be followed by Nigeria when new cables become operative this year (i.e., the WASACE cable, integrated in the “under construction” section of the “Capes” line in the illustration). Others will soon connect Latin America with Angola and South Africa as well (i.e., the BRICS Cable and SACS cables, again in the “under construction” section of the “Capes” line in the illustration). Europe dominates the immediately subsequent position in the rank. The two most central East-Asian country are China (17th), followed by India (29th), twelve positions below. French Senate Press Release - Internet: the [French] Senate wants to democratize Internet governance: "The mission states that the European Union has a role to play today: a new model of Internet governance , respectful of human rights and freedoms and able to restore confidence in the Internet, shaken by voluntary diminution of online security and malfunctions of ICANN..."
In a report published on July 9, 2014, the French Senate proposed a new form of internet governance (see graphic above). The French Proposal includes specifics to reform or replace ICANN with "WICANN -- World Internet Corporation for Assigned Names and Numbers" which "would be responsible for IANA functions assumed by the current ICANN" and would be overseen by GIC (see above) the Global Internet Council -- "leverage the Internet Governance Forum (IGF), ... to erect a World Council of Internet (Global Internet Council - GIC ), responsible for ensuring compliance with the principles of NETmundial [pdf] on behalf of the international community . This transformation could be done by the treaty already mentioned to establish the principles of NETmundial." 2. Rebuilding ICANN to restore confidence in the system of domain names - "The reform of ICANN is now accepted as necessary by all parties, even those who are not considering global ecosystem evolution of Internet governance." "Your mission considers that the legal status of ICANN, a California corporation, unable to inspire a lasting confidence in the system of domain names and, by extension, throughout the Internet. In the Affirmation of Commitments that binds ICANN -- U.S. Department of Commerce is an obligation to it have its headquarters in the United States. This provision may not be included in the new statement of commitments. "- an advisory capacity to the Board of Directors of this WICANN, comparable to the role of the GAC today... It is indeed important to implement the requirements set in Sao Paolo in accountability that WICANN "Independent checks and balances, as well as review and redress."" For a full list of all proposals within the French Senate Report, go to Domain Mondo's full list of all proposals. I wonder how much it cost them to get the domain name. | Hacker News: "I wonder how much it cost them to get the domain name... Probably under $100k... Location location location, am I right? Even if it was more, that's your brand. As we've seen that search engines can make or break you, this is one of the few things you can control... I'd be very surprised if 100k did the job. I would bet under $500k though. Still worth it..."
"Still worth it" say the innovators, founders, and venture capitalists -- for a dot Com domain name! Before the deal with Apple has closed, Jimmy Iovine's and Dr. Dre's Beats filed a trademark infringement action on July 9, 2014, in the United States District Court for the Northern District of Illinois (Chicago), case 14-cv-5209. According to the complaint the Defendants are individuals and business entities who "upon information and belief, reside in the People’s Republic of China or other foreign jurisdictions" and conduct business throughout the United States through the operation of the fully interactive commercial websites and online marketplaces. Abstract: This essay looks at the the different roles that multistakeholder institutions play in the Internet governance ecosystem. We propose a model for thinking of Internet governance within the context of the Internet's layered model. We use the example of the negotiations in Dubai in 2102 at the World Conference on International Telecommunications as an illustration for why it is important for different institutions within the governance system to focus on their respective areas of expertise (e.g., the ITU, ICANN, and IGF). Several areas of conflict (a "tussle") are reviewed, such as the desire to promote more broadband infrastructure, a topic that is in the remit of the International Telecommunications Union, but also the recurring desire of countries like Russia and China to use the ITU to regulate content and restrict free expression on the Internet through onerous cybersecurity and spam provisions. We conclude that it is folly to try and regulate all these areas through an international treaty, and encourage further development of mechanisms for global debate like the Internet Governance Forum (IGF). This map points out the highly uneven spatial distribution of (geotagged) Wikipedia articles in 44 language versions of the encyclopaedia. Slightly more than half of the global total of 3,336,473 articles are about places, events and people inside the red circle on the map, occupying only about 2.5% of the world’s land area. The map is based on Wikipedia data dumps encompassing 44 languages from November 2012. We excluded articles with more than four geotags, which typically consist of lists of geographic features. In the remaining data, we chose the most frequent geotag. If all geotags occurred only once, the first geotag (typically the most important one) was chosen as representative for the article. Additionally, we gathered article metrics such as number of characters and words in the article, the number of links to other Wikipedia articles, the number of external links and the number of in-article references. We mapped the article locations on top of a dataset that we obtained from Natural Earth using Buckminster Fuller’s Dymaxion map projection that has little distortion of shape and area and highlights that there is no ‘right way up’. The map highlights the fact that a majority of content produced in Wikipedia is about a relatively small part of our planet. This finding supports previous work on the geographical biases of Wikipedia. Consider for example this visualization of the state of Wikipedia in 2010. We know that different language versions have varying shares of geocoded articles. English, Polish, German, Dutch and French are the Wikipedias with the largest numbers of geotagged articles. Since all these languages are spoken in Europe they may make a significant contribution to the dominant position of this continent in the above map. By contrast, other continents are much less represented in the world’s most prominent digital repository of human knowledge. 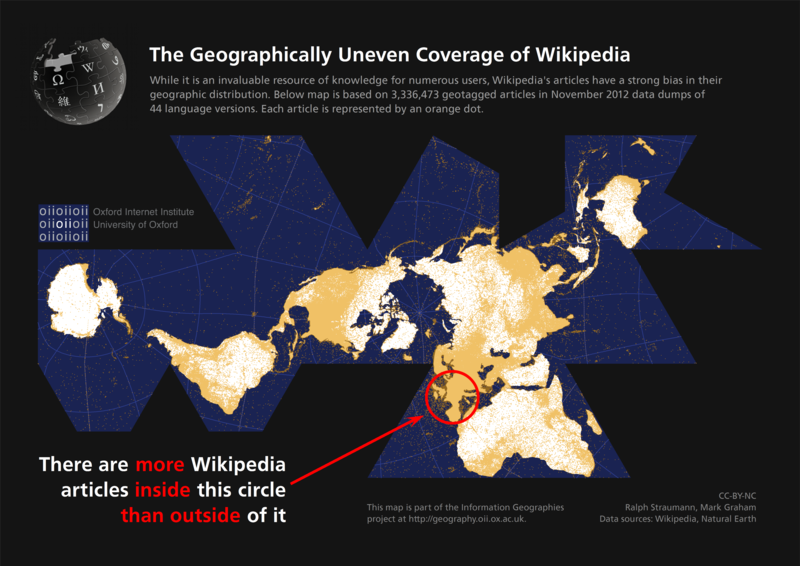 As we pointed out in the post about Africa on Wikipedia, the whole continent of Africa contains only about 2.6% of the world’s geotagged Wikipedia articles despite having 14% of the world’s population and 20% of the world’s land. Further exploring the two groups represented in the map above (the inside and the outside of the red circle), we find that Wikipedia articles inside the circle have had a head start: they are on average a bit older than those outside. Especially in 2005 and 2006, editing activity about this European area picked up much faster than in the rest of the world. IANA transition update -- ICANN: The Coordination Group is comprised of 27 individuals representing 13 communities, and includes direct and indirect stakeholders. The first face-to-face meeting of the Coordination Group will take place in London from 17-18 July at the Hilton London Metropole Hotel and will be streamed LIVE. ALAC _____; ALAC _____; ASO Hartmut Glaser; ccNSO_____; ccNSO _____; ccNSO _____; ccNSO _____; GAC _____; GAC _____; GNSO Wolf-Ulrich Knoben; GNSO Milton Mueller; GNSO _____; gTLD Registries Keith Drazek; gTLD Registries Jon Nevett; ICC/BASIS Joseph Alhadeff; IAB Russ Housley; IAB Lynn St Amour; IETF Jari Arkko; IETF Alissa Cooper; ISOC Narelle Clark; ISOC Demi Getschko; NRO Adiel Akplogan; NRO Paul Wilson; RSSAC Daniel Karrenberg; RSSAC Lars-Johan Liman; SSAC Patrik Fälström; SSAC Russ Mundy. See the NTIA IANA Functions' Stewardship Transition microsite for more information. Before Matt Cutts left to go on leave from Google through October, 2014, he left some words of advice on his blog: Matt Cutts On Leave: ".... how should [anyone]... communicate with Google about search topics or find out about new things in search? WPP plc - Wikipedia: "WPP plc is a British multinational advertising and public relations company with its main management office in London, United Kingdom, and its executive office in Dublin, Ireland. It is the world's largest advertising company by revenues, and employs around 162,000 people in 3,000 offices across 110 countries. It owns a number of advertising, public relations and market research networks, including Grey, Burson-Marsteller, Hill & Knowlton, JWT, Ogilvy Group, TNS, Young & Rubicam and Cohn & Wolfe"
Rep. Eshoo serves as the Ranking Democrat Member of the Energy and Commerce Committee's Subcommittee on Communications and Technology for the 113th Congress. Serving in Congress since 1993, she represents California's 18th congressional district which includes part of Silicon Valley and includes the cities of San Jose, Redwood City, Sunnyvale, Mountain View and Palo Alto. This is IANA, this ICANN, see the DIFFERENCE? 3 blocks of ASNs were allocated to RIPE NCC yesterday (http://goo.gl/Xc06g) & 45/8 was updated (http://goo.gl/Y3Up8). 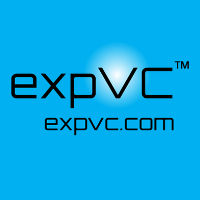 #IPv4: 102, 103, 104, 179 and 185 have been allocated. No unicast IPv4 /8s remain unallocated.